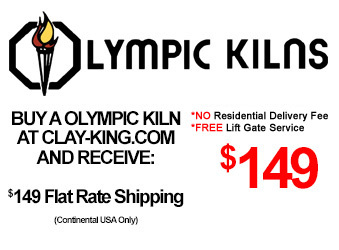 Oval kilns are designed for large workloads and unusual shapes that do not fit in a cylindrical or square shape kiln. Olympic Oval models are built with 3" brick and have a 2" blank brick row in the first section of the kiln to protect the elements when loading and unloading the kiln. Oval models are built with Olympic's proven electrical box design which has heat shields with top and bottom perforations to keep the electrical components cool, and balanced heating elements insure even heating of the firing chamber under all firing conditions. Oval kilns come equipped with pilot light, metal stand, stainless steel jacket, lid lift assist, and Bartlett V6-CF electronic controller. Two-year Limited Kiln Warranty for cone 8 models and one-year Limited Kiln Warranty for cone 10 models. 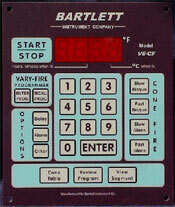 Includes the 12 key digital Bartlett V6-CF controller for more ramp-hold user programs and multiple features including delay start, preheat, cone offset, skip step and many more for precise firings every time. Messages and Information are available for reviewing a firing profile before or during the firing, viewing the current segment the firing is in, and cone table for easy look up of temperature and cone number equivalents. 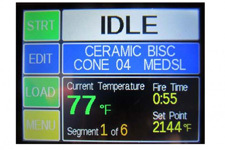 Other options include Type S thermocouple, 480 volt, 2 or 3 zone control, vent, and much more! 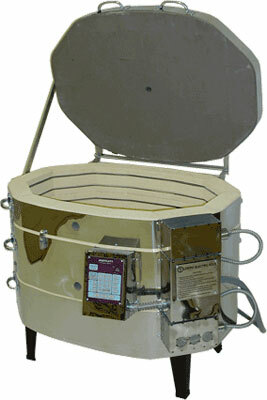 Furniture kits are available for the oval electric kilns; however, you can create your own furniture kit. Oval furniture kits come with three layers of shelving with two half shelves on either end and one rectangle shelf in the center to create an oval shape and one layer of shelving. Large square posts are included in the furniture kit in assorted sizes. CoreLite full shelves are available for the 25 and 30 Oval models. The Olympic Oval 2018E kiln is available with an Bartlett V6-CF Digital controller. The vary-fire method gives you the freedom to create up to six, 8-step user programs to fire your ceramics, crystalline glazes, glass or jewelry. Other features include delay start, preheat, alarm, cone adjustments, thermocouple adjustments, °F or °C operation, 16 segment program, and skip step.